If it's not against policy I'd like to keep a running thread going for people to post, if they wish, what their most recent purchase was. I know there's too many stocks to keep constant tabs on so I like the idea of being reminded of ideas others are looking at. I bought QCOM @ 71.51 today. 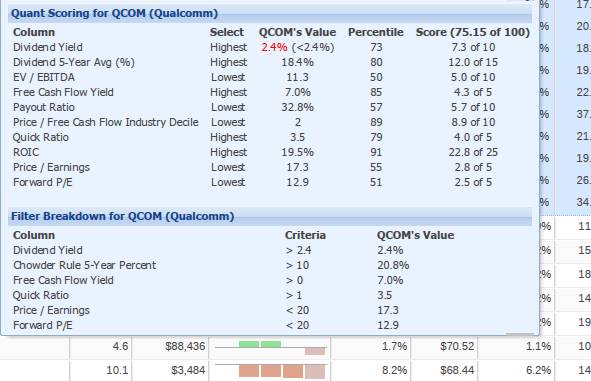 QCOM was already my 13th largest holding but I think the risk / reward going forward is worth the additional dollars. I would've liked to add more of something with a larger yield like MO, ARLP, COP or OHI ... but in the end I've spent the most time recently looking at QCOM and liking what I see. Wish I had more cash on hand. Would love to buy QCOM at these levels. I bought CVX. Details here. Great idea for a thread to keep it centralized. I'm out of investable cash at the moment, but there are getting to be plenty of great buys out there, especially in energy. I'm also out of funds at the moment. Hopefully the market doesn't come roaring back before I can make my next purchase. I picked up some XOM. We have about 4% in cash right now. Not averse to putting it to work but I'm such a cheapskate I just want a bargain now. Nothing purchased this week. Had some lowball limit orders in for HP, ESV & GE but none triggered. Bring back the flash crash. Also looking to add to OHI, O, WPC or open a position in SO but none of them would cooperate. I don't think BBL has found a psychological bottom yet but thinking of adding here too. One homework assignment this weekend is to do a GE/EMR comparison. EMR dropped just enough to pique my interest. Lost it to a covered call several years ago and it took off from there. Have not purchased yet, but looking hard at ORI and BP and with a little more drop, just might own some next week. Oh man, I could spam this thread. With 100 free trades per month at MerrillEdge and cash on hand, I've been averaging (mostly down) into stocks little by little on a daily basis. Recently I've been building a position in Quanta Services (PWR), which is a specialized construction company that builds grid projects. As one of the few major players in this space they have a wide moat, and they have a large backlog and no debt. They don't pay a dividend but they are buying back shares. Matching my investments in PWR with purchases of CBI, since CBI is somewhat similar but drastically on sale. I consider this a 1 year swing trade. (10-11-2014, 01:13 PM)earthtodan Wrote: Oh man, I could spam this thread. With 100 free trades per month at MerrillEdge and cash on hand, I've been averaging (mostly down) into stocks little by little on a daily basis. Recently I've been building a position in Quanta Services (PWR), which is a specialized construction company that builds grid projects. As one of the few major players in this space they have a large moat, and they have a large backlog and no debt. They don't pay a dividend but they are buying back shares. I'm fortunate to have the 100 free trades a year as well. Not nearly as good as 100 a month...but not bad. I got into Wells Fargo Advisors and have had 100 free every year since. I don't use that many, but it is nice to be able to add to my positions on dips without paying fees. Bought XOM, TRV, TIS, LTC, and SSW the other day. Looking at SWK and BDX, but they are too expensive right now.